NASHUA, New Hampshire (CNN) -- The economy in southern New Hampshire is not by any means among the worst in the nation. Still, according to city records, there are 29 foreclosed homes on the books in Nashua -- many of which are in deplorable condition. 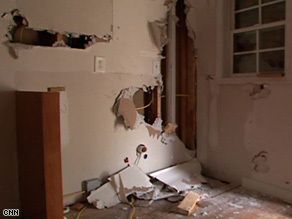 Walls had been ripped open in this foreclosed home in Atlanta, Georgia. "This house is not livable right now," Nelson Ortega, the city's chief building code inspector, told CNN as he stood in front of a boarded-up single-family home on a residential street in Nashua. The foundation of the house was fractured, Ortega said, and there were cracks and fissures in many of the supporting beams. At the side entrance to the house were broken windows, garbage and peeling paint. In 2006, Ortega said, the property sold for $200,000. It's anyone's guess, he said, what price the home might bring now, if it ever sold. That this foreclosed home might not ever sell was not news to a researcher who lives nearby. "About a third of all of the foreclosed properties nationwide have been so damaged, either by the previous owners or by criminal gangs coming in after the foreclosure, that they no longer qualify for standard mortgage financing," Thomas Popik told CNN. "So there is going to be all kinds of government programs to help, but if they don't qualify for standard mortgage financing, there's no one to buy these properties." Popik says responses from thousands of real estate agents nationwide to the questionnaires he sends out quarterly indicate that badly damaged foreclosed homes -- so-called "distressed" properties in real estate jargon -- are a much bigger element of the national housing picture than officials in Washington have acknowledged. Popik's work is under the auspices of Campbell Communications, a Washington-based group that supplies data to private mortgage industry analysts. "In many cases, it costs so much to rehabilitate these houses, it's just not cost-effective," he told CNN. "And the properties are eventually going to be bulldozed." In some cities hit harder by the national economic downturn, a quick glance at foreclosed homes paints an even harsher picture. "A lot of these homes have been vandalized," Dana Ash, an Atlanta, Georgia, real estate broker, told CNN. She was speaking in front of several foreclosed, boarded-up houses not far from the city's center. "They are a little scary going into them," she said. "The power is out, a lot of them are boarded up." A CNN camera crew was allowed into several of the houses. Trash was everywhere; plaster walls had been ripped open to expose wiring; and in one case a toilet was dumped on an empty living room floor. The banks that own the properties, Ash told CNN, probably will not simply walk away from the homes. "Usually abandoning homes means it hasn't sold," she explained. "They will eventually sell. It will be pennies at best on the dollar, but they will eventually sell." From his office in New Hampshire, Popik said he is not at all certain of that. "There are some cases where the properties have been so damaged that it's not profitable for the mortgage investor, which is a bank, to take title to the property," he said. The Mortgage Bankers Association told CNN it found no hard evidence of such a trend. Some of the information, a spokesman said, was "anecdotal," but there was no data one way or the other yet collected. A spokesman for the Department of Housing and Urban Development in Washington told CNN that unsalable homes are still a relatively small part of the national inventory of foreclosed properties. But, the spokesman added, the worse the economy is in a particular region, the more damaged and vandalized foreclosed homes are likely to be.